Communications management is about keeping everybody in the loop. 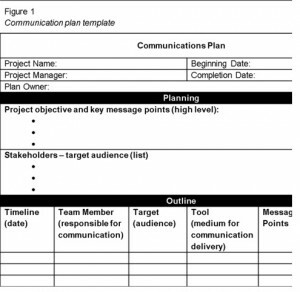 The communications planning process concerns defining the types of information you will deliver, who will receive it, the format for communicating it, and the timing of its release and distribution. It turns out that 90% of a project manager’s job is spent on communication so it’s important to make sure everybody gets the right message at the right time. The first step in defining your communication plan is figuring out what kind of communication your stakeholders need from the project so they can make good decisions. This is called the communications requirements analysis. Your project will produce a lot of information; you don’t want to overwhelm your stakeholders with all of it. Your job is to figure out what they feel is valuable. Communicating valuable information doesn’t mean you always paint a rosy picture. Communications to stakeholders may consist of either good news or bad news. The point is that you don’t want to bury stakeholders in too much information but you do want to give them enough so that they’re informed and can make appropriate decisions. Communications technology has a major impact on how you keep people in the loop. Methods of communicating can take many forms, such as written reports, conversations, email, formal status reports, meetings, online databases, online schedules, and project websites. You should consider several factors before deciding what methods you’ll choose to transfer information. The timing of the information exchange or need for updates is the first factor. Do you need to procure new technology or systems, or are there systems already in place that will work? The technologies available to you should figure into your plan of how you will keep everyone notified of project status and issues. Staff experience with the technology is another factor. Are there project team members and stakeholders experienced at using this technology, or will you need to train them? Finally, consider the duration of the project and the project environment. Will the technology you’re choosing work throughout the life of the project or will it have to be upgraded or updated at some point? And how does the project team function? Are they located together or spread out across several campuses or locations? The answers to these questions should be documented in the communication plan. All projects require a sound communication plan, but not all projects will have the same types of com­munication or the same methods for distributing the information. The communication plan documents the types of information needs the stakeholders have, when the information should be distributed, and how the information will be delivered. The types of information you will communicate typically include project status, project scope statements and updates, project baseline information, risks, action items, performance measures, project acceptance, and so on. It’s important that the information needs of the stakeholders be determined as early in the planning phase of the project management life cycle as possible so that as you and your team develop project planning documents, you already know who should receive copies of them and how they should be delivered. Completing a complex project successfully requires good communication among team members. If those team members work in the same building, they can arrange regular meetings, simply stop by each other’s office space to get a quick answer, or even discuss a project informally at other office functions. Many projects are performed by teams that interact primarily through electronic communication and are, therefore, called virtual teams. To avoid miscommunication that can harm trust and to include team members in a project culture, the project team needs a plan for communicating reliably and in a timely manner. This planning begins with understanding two major categories of communication. Modern communication technologies make it possible to assemble project teams from anywhere in the world. Most people work during daylight hours, which can make synchronous meetings difficult if the participants are in different time zones. However, it can be an advantage in some circumstances; for example, if something must be done by the start of business tomorrow, team members in Asia can work on the problem during their normal work hours while team members in North America get some sleep. Figure 15.1: World Time Zones. 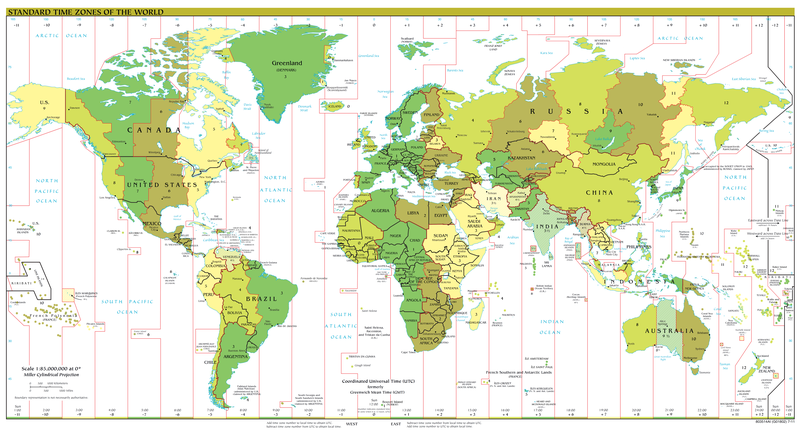 Time zones are calculated in reference to the time zone of the Royal Observatory in Greenwich, England. The time at that location is Greenwich Mean Time (GMT). More recent references designate it as Coordinated Universal Time (UTC) instead of GMT. The time zones advance from Greenwich in an easterly direction (Figure 15.1). However, at the international dateline (about the midpoint around the world from Greenwich), you subtract the time zone from GMT. To prevent confusion between a.m. and p.m., times are often given using a 24-hour clock. For example, midnight is indicated as 00:00, noon is 12:00 and 1 p.m. is 13:00. A project manager for a software development project in Toronto is five time zones west of the reference zone, so the time is given as UTC–5 (or GMT–5). If it is noon in the reference zone, it is 7 a.m. (five hours earlier) in Toronto. The manager would like to contact a project team member in Paris, France. Paris is one time zone east of the reference zone (UTC+1 or GMT+1). If it is noon (12:00) in the reference zone, it is 1 p.m. (13:00) in Paris. This means that there is a six-hour difference between Toronto and Paris. If the project manager waits until after lunch to place the call (1 p.m. in Toronto), it will be too late in the day in Paris (7 p.m.) to reach someone. Getting a team together at the same time can be a challenge—especially if they are spread out across time zones. Many types of communication do not require that the parties are present at the same time. This type of communication is asynchronous. There are several choices of asynchronous communications. Many companies prefer that final contracts are personally signed by an authorized representative of each party to the agreement. If several signatures are required, this can take weeks to get all the signatures if the contracts are transferred by a postal service. If this process is holding up the start of the project, you can use an overnight delivery service to minimize the time spent transferring the documents. Fax machines have been around a long time and enjoy a high level of trust for transmitting documents accurately. Although it might seem archaic to still use fax transmissions, in many countries a fax of a signed contract is legal, but a computer-scanned image is not. Information can be sent to a list of team members. Messages can be saved to document the process in case of a misunderstanding or miscommunication. Files can be attached and distributed. A blog is an online journal that can be private, shared by invitation, or made available to the world. Some project managers keep a journal in which they summarize the day’s challenges and triumphs and the decisions they made. They return to this journal at a later date to review their decision-making process after the results of those decisions are known to see if they can learn from their mistakes. Many decisions in project management are made with incomplete knowledge, and reflecting on previous decisions to develop this decision-making skill is important to growth as a project manager. Some projects are directly affected by external factors such as political elections, economic trends, corporate mergers, technological or scientific breakthroughs, or weather. To keep informed about these factors, you can subscribe to online news sources. A technology that facilitates this process is Really Simple Syndication (RSS). Web pages with RSS news feeds have labeled links. If the user clicks on the RSS feed, news from the website is automatically sent to the user’s news reader, such as Google Reader. The news reader can be set to filter the news for key words to limit the stories to those that are relevant to the project. Does the new communication technology provide a competitive advantage for the project by reducing cost, saving time, or preventing mistakes? Does the project team have the expertise to learn the new technology quickly? Does the company offer support such as a help desk and equipment service for new communication technology? So how do you create a communication plan? Document items – templates, formats, or documents the project must use for communicating. 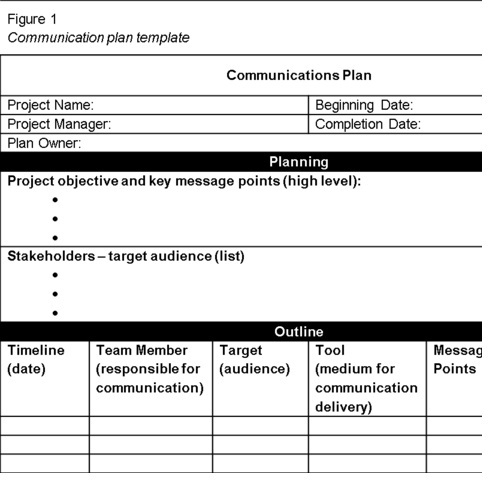 Figure 15.2 shows a communication plan template. This chapter of Project Management is a derivative copy of Project Management for Instructional Designers by Amado, M., Ashton, K., Ashton, S., Bostwick, J., Clements, G., Drysdale, J., Francis, J., Harrison, B., Nan, V., Nisse, A., Randall, D., Rino, J., Robinson, J., Snyder, A., Wiley, D., & Anonymous. (DATE). Project Management for Instructional Designers. Retrieved from http://pm4id.org/ licensed under Creative Commons Attribution 3.0 Unported and Communication Plans by Inte6160 Wiki licensed under Creative Commons Attribution 3.0 Unported. 15. Communication Planning by bpayne and Adrienne Watt is licensed under a Creative Commons Attribution 4.0 International License, except where otherwise noted.